You may have heard the fancy term “pitch axis theory”…and you may even know a thing or two about how it works. But what you DON’T yet know is how to (easily) apply a variation of this broad topic to create TONS of (different) emotions in your guitar playing! After you watch this video and have mastered this concept - which only takes a few minutes - you will instantly be able to play intense and emotional guitar solos that will send chills down the spine of anyone listening. 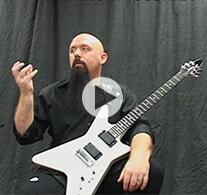 Learn how to play highly emotional guitar solos right now by using the powerful pitch axis theory concepts explained in this video. Simply enter your name and email, then click the "Show Me The Video" button to enter. All of your information is always kept 100% private and confidential.